Note: IBM Blockchain Platform now utilizes Hyperledger Fabric for end-to-end development. Users may use Hyperledger Composer at their choice, but IBM will not provide support for it. For more on Hyperledger Fabric, please visit https://developer.ibm.com/components/hyperledger-fabric/. This tutorial gets you started developing a blockchain network. 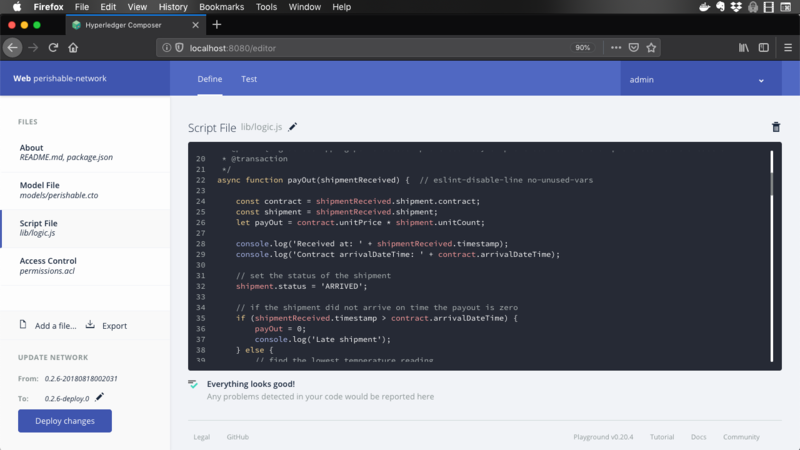 I’ll introduce you to Hyperledger Composer and its user interface, Hyperledger Composer Playground, where you can model and test your network with nothing more than Docker and your web browser. In Part 2, you’ll learn how to refine and deploy your blockchain network, and in Part 3, you’ll see how to install Hyperledger Fabric on your computer, deploy your business network to your local instance, and interact with the sample network blockchain application. What does CTO stand for? In this part of the tutorial series, I’m going to introduce you to CTO modeling language and Hyperledger Composer Playground. I’ll save the CLI for Part 2 of this series, where I will show you all about the CLI (and lots more). Hyperledger Composer has its own modeling language (called CTO) used to model your business network. In Part 1, I’ll show you how to use CTO to model the sample Perishable Goods network. This sample business network demonstrates how growers, shippers, and importers define contracts for the price of perishable goods, based on temperature readings received for shipping containers. 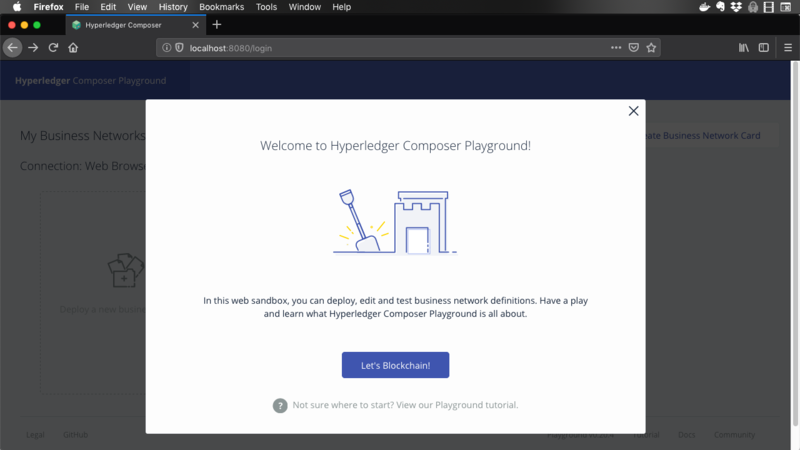 Hyperledger Composer Playground is a browser-based interface that you can use to model your business network: what items of value (assets) are exchanged, who participates (participants) in their exchange, how access is secured (access control), what business logic (transactions) is involved in the process, and more. Hyperledger Composer Playground (Playground from now on) uses your browser’s local storage to simulate the blockchain network’s state storage, which means you don’t need to run a real validating peer network to use Playground. 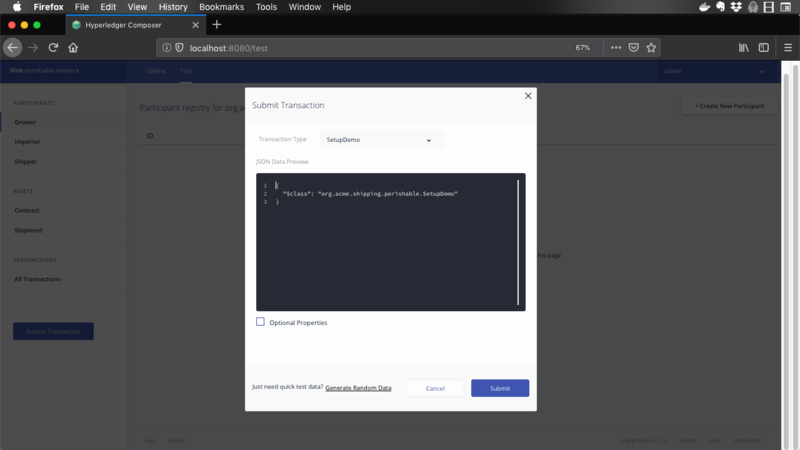 In Part 3, I’ll give you an advanced look at Composer: how to generate a REST interface and GUI using Yeoman, and how to deploy your blockchain network application to the IBM Cloud. Get a monthly roundup of the best free tools, training, and community resources to help you put blockchain to work. In the next section, I’ll introduce you to common business network terminology. First, I want to tell you about the business problem that your first blockchain business network will solve: shipment of perishable goods. More importantly, how the Internet of Things, temperature sensors, and the Cloud are used to ensure the perishables are shipped in ideal conditions (and what happens if not). What’s IoT got to do with it? Seems like the Internet of Things is everywhere. The Perishable Goods network gets temperature readings from an array of IoT sensors that transmit the temperature within cargo containers to the IBM Cloud, where that sensor data is stored in the blockchain. Learn more about the convergence of IoT and Blockchain. I’ll be using this business network as the example throughout this tutorial series. As you progress through the series, you will notice the application growing in complexity as I introduce more Hyperledger Composer concepts, and show how they relate to blockchain and the IBM Cloud. You name it. If it has perceived value, and can be exchanged between parties, it’s an asset. In the Perishable Goods network, assets include the perishable goods themselves, shipments of those goods, and the contracts that govern the activities performed during the exchange. A participant is a member of a business network. For the Perishable Goods network, this includes the growers who produce the perishable goods, the shippers who transport them from the growers to the ports, and the importers who take delivery of the goods at the ports. Obviously, this model is oversimplified, but it should give you a sense of how real-world applications are modeled using business network terminology. In a business network, not every participant has access to everything. For example, a grower does not have access to the contract between the shipper and the importer. Access control is used to limit who has access to what (and under what conditions). When an asset is “touched,” that interaction potentially affects the state of the blockchain ledger. The interaction is modeled in Hyperledger Composer as a transaction. Transactions are the business logic (or smart contracts) of the system. An event is a notification produced by the blockchain application, and consumed by an external entity (such as an application) in publish/subscribe fashion. While the blockchain ledger is updated as assets are exchanged in the system, this is an internal (system) process. However, there are times when an external entity needs to be notified that the state of the ledger has changed, or that maybe something else of note has occurred (or not occurred but should have) in the system. Your blockchain application could use an event in this case. A temperature reading has exceeded an upper or lower boundary X number of times (this might indicate a problem with the shipping container itself, for example). A shipment has been received. A shipment has arrived at the port (an IoT GPS sensor could report this event, for example). 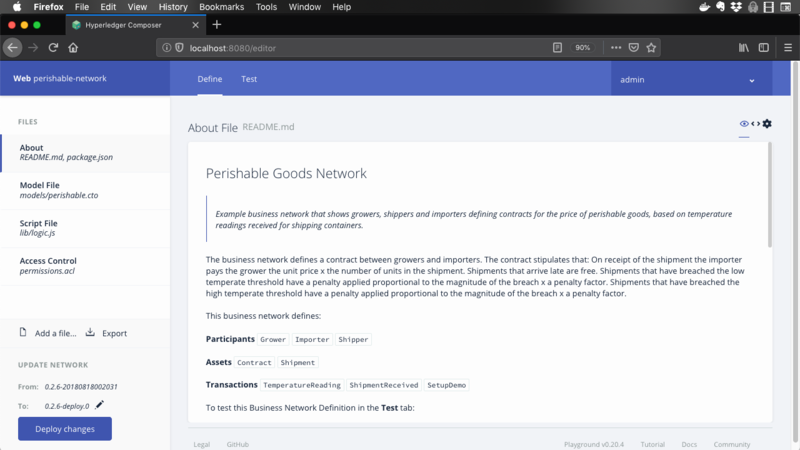 In the next section, I’ll show you how to model the Perishable Goods network of assets, participants, and transactions. I’ll touch on access control, and save events for Part 2 of this series. Playground is an environment that lets you quickly build and test blockchain business networks. It doesn’t need a running blockchain network, and so it reduces the complexity of getting a business network defined, validated, and tested. This mode installs Playground with the Hyperledger Fabric validating peer network, and includes the Docker container for Playground, along with all the other Docker containers to run a Hyperledger Fabric validating peer network. As you get deeper into the tutorial in Parts 2 and 3, you will need a full Hyperledger Fabric validating peer network. For now, it is overkill, as none of the activities you’ll perform in Part 1 require this. Using browser-only mode, you can model and test the business network using a mock blockchain ledger that resides in your browser’s local storage. This is the approach I’ll use for Part 1. In this video, I’ll show you how to run Playground using Docker, and give you a tour of the Playground UI. Before you can use Hyperledger Composer to test and deploy a blockchain business network, you have to build a model of it. Hyperledger Composer has its own modeling language for doing this. Oh, great, another language to learn, right? Fortunately, the CTO modeling language is simple (and intuitive if you have worked with object-oriented concepts). If your model is very large, you can have multiple .cto model files, as necessary. Every .cto model file must include a single namespace and at least one resource definition. A namespace creates a boundary within whose scope names are considered to be unique. Every .cto model file requires a namespace, which means every name within a .cto model file must be unique. You’re already familiar with the concept of a namespace, even if you didn’t realize it. File systems use the directory as the namespace, so that two files within the same directory cannot have the same name. However, two files in different directories are allowed to have the same name, since they are in different namespaces. To sum up: Two resources in a CTO model file (the namespace boundary) cannot have the same name. Each resource type corresponds to its model type of the same name (for example, asset is used to model an Asset, participant models a Participant, etc.). Let’s look at the example above, and I’ll point out a few things. The asset keyword indicates Shipment is an asset. The property (indicated by lowercase “o”) shipmentId is of type String, and uniquely identifies a Shipment (as indicated by identified by). Its properties each have a type, which can be a fundamental type (like String) or an enumerated type (like ProductType), or transaction (like an array of TemperatureReading). When the set of values a particular property can have is known, you should model that as an enumerated type. This makes it easier to constrain the values, which makes validation simpler. When an entity exists in your business model, but is not an asset, participant, transaction, or event, you model the entity as a concept. The concept of Address is an important one in a business model, but doesn’t exactly fit one of the other categories, which is why you model it as a concept. Imports are used in a .cto model file to indicate a relationship between an entity in that model file and an entity from another model file. I won’t talk about imports in this tutorial, since the model you’ll be working with is so small. The concept is similar to import in the Java™ language, and #include in C++. Once you learn the basic syntax (which in most cases is obvious by context), the modeling language should be easy to pick up. If you have worked with object-oriented concepts, it will be easier still. If you want to learn more, I recommend you read the full documentation for the CTO modeling language. In the previous video, I showed you how to create an empty business model using Playground. 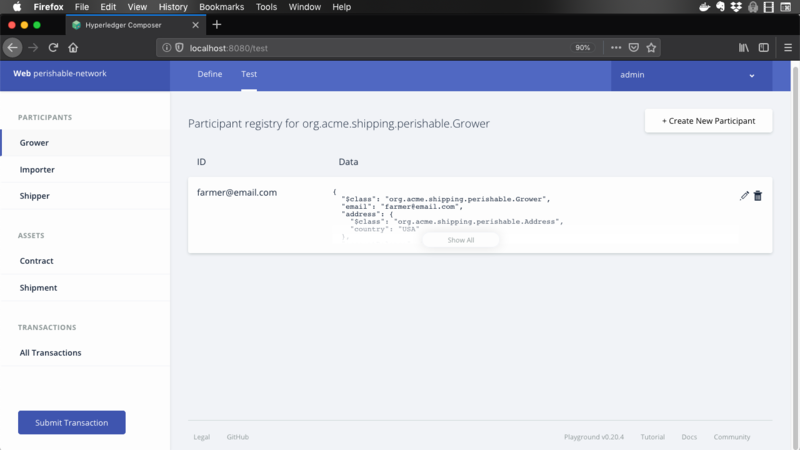 In this section, you’re going to model the Perishable Goods network in Playground (don’t worry, you’ll have help from the built-in perishable-network template). In the previous video, I showed you how to create a new, empty business network in Playground, as well as the basics of how to get around in Playground, so I won’t go over those again here. If you didn’t get a chance to watch the video, you should check it out before trying to follow along (if you haven’t watched the video, make sure the local Playground is running in Docker). Click the Let’s Blockchain button to get started (see Figure 1). Next, create a new business network from the perishable-network template. Call it perishable-iot-network and click Deploy. On the Admin ID card, click the Connect now link. You should see something like Figure 2. When you select one of the files under FILES, it opens in the editor window on the right side. Go ahead and open the model file (perishable.cto), which contains the model. * negociated temperatures for the shipment. Click the Test tab at the top of the screen and you will see something like Figure 3. Notice the Assets and Participants from the model appear on the left side of the screen, but in the center of the screen is a message saying the registry is empty. What’s going on? As I showed you in the video, when the business network is first created, both the Asset and Participant registries are empty. You need to create Asset and Participant instances, and those instances will reside in the registry. In the next section, I’ll show you how to instantiate and test the model. Models are great at acting as a sort of blueprint for the application you’re building, but a model of a thing is not much good unless it results (at some point) in an actual thing. For example, a set of blueprints for a skyscraper is critical if you’re going to construct a building, but not much good unless at some point they are actually used to build (instantiate) an actual building! Back to the business model, which, if it is going to be useful, needs to be instantiated. But what does that mean for a blockchain application? Earlier you saw the model for a Grower participant, Shipment asset, and so forth. Now it’s time to instantiate those resources, and their instances will live in their respective registries. So asset instances go in the asset registry, and participant instances go in the participant registry. I encourage you to open the lib/logic.js file in the editor and look at it for yourself. To execute the SetupDemo transaction, click the Submit Transaction button, and a modal dialog appears that should resemble Figure 4. Make sure that SetupDemo appears in the Transaction Type drop-down, then click the Submit button. When the transaction executes successfully, you will see a brief notification message telling you so. Select Grower in the ASSETS pane on the left side, and all of its instances appear on the right side (Figure 5). The same is true for the other resources (go ahead, try it!). Now that you have a business network defined, and assets and participants in their respective registries, you can test your network. So far in this section, I’ve talked about assets and participants, but what about the transactions in the business model? Where do they show up? The temperature inside the shipping container is to be 6 degrees Celsius at all times. If the temperature of the shipment falls outside of the agreed-upon range (+/- 5 degrees), then the price of the shipment ($0.50/unit) is reduced by $0.20/unit for every degree below and $0.10 for every degree above. If the shipment arrives late, the Grower receives no payment for the shipment. Figure 6 shows the smart contract code (from lib/logic.js) that enforces the second stipulation (zero payout for a late shipment) from the contract. Access control is governed by a file in the model called permissions.acl. In the Business network concepts section, I introduced access control as one of the primary concepts. In Parts 2 and 3, I will cover more of this extremely important topic and how you control access to your blockchain application. * Sample access control list. description: "Allow all participants access to all resources"
description:  "System ACL to permit all access"
description: "Grant business network administrators full access to user resources"
description: "Grant business network administrators full access to system resources"
The ACL file contains rules that let you control access to the resources in your blockchain application. Suffice it to say, Hyperledger Composer has you covered when it comes to security, and I’ll show you all about it later in this tutorial series. For now, the access control rules defined above pretty much grant wide-open access, which is fine for now since you’re just starting out with Hyperledger Composer. So now you’re ready to test the smart contract. With Playground running in your browser, click the Test tab at the top of the Playground UI. Let’s look at the components of this scenario one at a time, starting with the temperature sensor data. In a real-world application, the IoT temperature sensors could, say, send this data to the IBM Cloud, where the smart contract code would be invoked against the blockchain to record these transactions. In Playground, the blockchain is maintained in your browser’s local storage, but the transaction code that executes is the same regardless of where the blockchain resides (which makes Playground a perfect place to test, right?). In the real-world app, when an IoT sensor in the shipping container wants to send a reading, it sends it to the cloud (through the cargo ship’s network), where it is picked up by, say, a serverless function running in OpenWhisk, which invokes the temperatureReading() function. Click the Submit Transaction button (just like you did to invoke the setupDemo() function). Make sure TemperatureReading appears in the Transaction Type drop-down. Change the “centigrade” reading from 0 to 5 (the first reading we want to send) in the JSON Data Preview window. Make sure the shipment ID is set to SHIP_001. Repeat for the remaining three readings. To receive the shipment in a real-world application, an app running on the importer’s hand-held device could indicate to an application running in the IBM Cloud (or a serverless function running in OpenWhisk) that the shipment was received, which would then calculate payment to be remitted to the grower. To simulate receipt of the shipment in Playground, run the ShipmentReceived transaction in Playground, make sure to provide the shipment’s ID, and click Submit. So you have this great blockchain business model. Now what? Let’s suppose you want to make the model available to other members of your team, or need to export the model to deploy it to a real blockchain network in production (I’ll show you how to do this in Part 2). Playground has an export feature that allows you to create a Business Network Archive (BNA) file that you can share. To export the model, in the Define tab, click the Export link at the bottom left of the screen, and Playground generates a Business Network Archive (BNA) file and then downloads it to your computer. Let’s suppose you have a Business Model Archive (BNA) file — maybe it was given to you by a team member — and you want to play around with it in Playground. How do you get a BNA file into Playground? First, make sure Playground is up and running. Then clear your browser’s local storage of the previous network (how you do this depends on which browser you use). On the main screen, click Drop here to upload or browse, use the browse dialog to locate and select the BNA file you want to import, and choose Open. Then click Import and confirm that you want to replace the current model with the one you want to import. Note: If you run into trouble importing the BNA file, you may need to clear your browser’s local storage, then try the import again (how you do this depends on which browser you use). 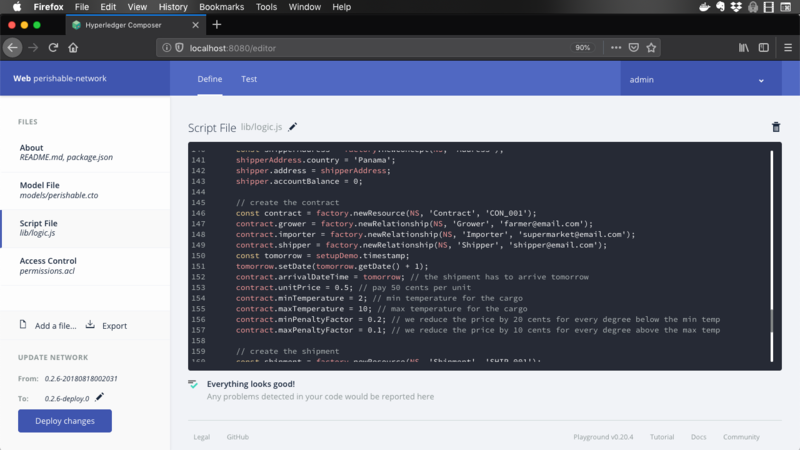 Part 1 of this tutorial series showed how to run Playground using Docker and introduced to the basics of the Hyperledger Composer modeling language (CTO). You also saw what a simple business network model looks like in Playground by creating a new business network that was built on the perishable-network template provided by the Playground Docker image. Then the tutorial showed you how to test that model by storing various temperature reading transactions to the blockchain, and how the smart contract used those transactions to resolve the terms of the contract when the Shipment was received. Finally, I showed you how to share models with colleagues and others by exporting and importing models out of and into Playground, respectively. Now head on over to Part 2, where I’ll show you how to build on and refine the existing business network from this part, as well as unit-test it and deploy it to the IBM Cloud. This content was originally published on IBM developerWorks on October 5, 2017.